Howard Silverblatt also noted, “Preliminary cash reserves increased from Q3 2017, setting another record. 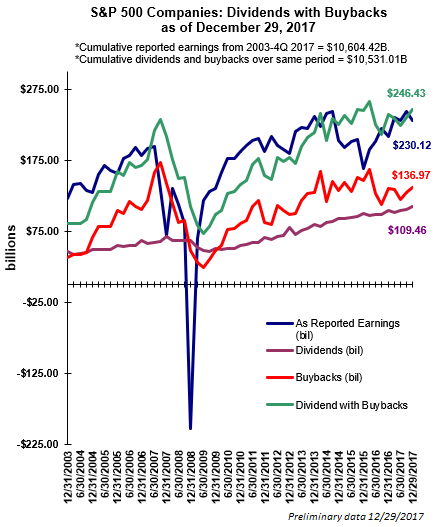 S&P 500 Industrial (Old), which consists of the S&P 500 less Financials, Transportations, Real Estate and Utilities, available cash and equivalent stood at $1.636 trillion, slightly above the $1.630 trillion level for Q3 2017; available cash stood at $1.478 trillion for Q4 2016. As noted earlier, S&P’s press release mentions the benefits of lower corporate taxes and repatriation may serve as a tailwind for 2018.